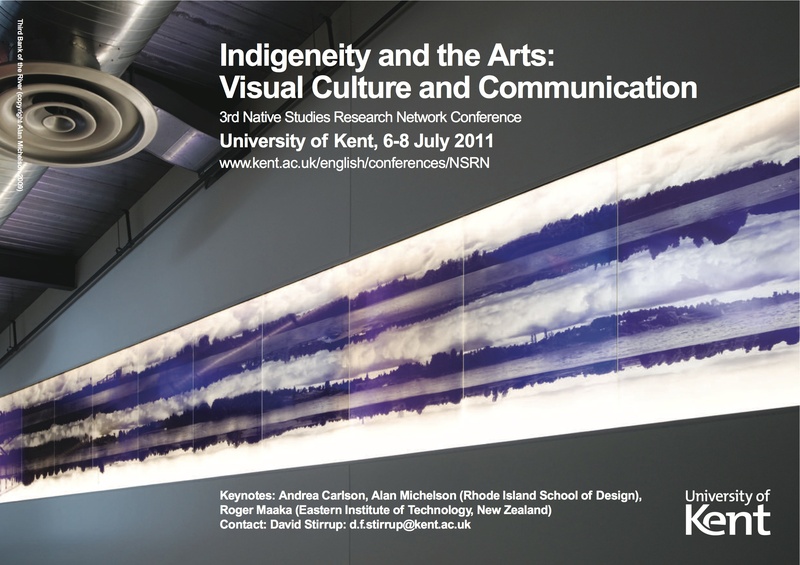 We have held conferences in Geneva (2007 – see below), at the University of East Anglia (Indigenous Bodies, 2009) and at the University of Kent (Indigeneity and the Arts: Visual Culture and Communication, 2011). In addition, we have held one-day colloquia at the Institute for the Study of the Americas in London in 2006, 2008, 2012, 2014 and 2015. Guest and Keynote speakers to date have included: Mick Gidley; Osage poet and Medieval scholar Carter Revard; Laura Peers of the Pitt Rivers Museum in Oxford; Six Nations Mohawk artist Alan Michelson; Anishinaabe artist Andrea Carlson; Maori scholar Roger Maaka; Acoma Pueblo poet and scholar Simon Ortiz; Osage scholar Robert Warrior; Creek scholar K. Tsianina Lomawaima; and poetry readings from Anishinaabeg poets Kimberly Blaeser and Gordon Henry, Jr. (in collaboration with a reading tour organised by David Stirrup at the University of Kent). In addition, we’ve heard many wonderful papers from colleagues in the UK, across Europe, and the USA and Canada. If you would like to be kept up to date about future events, please ensure you ‘follow’ this site, check out our cfp page, or even better, join the network! The inaugural international conference of the Native Studies Research Network (NSRNUK) was held at the University of Geneva on 16-17 July this year. The event was truly multi-disciplinary in content, encompassing literature, history, language conservation and anthropology. 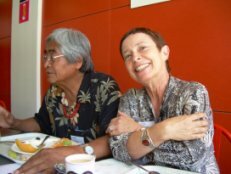 Scholars from the United States, Europe and Australasia met and shared perspectives on the nature, purpose and future of Native Studies, as well the conference theme, Native voices and languages. The conference featured several acclaimed guest and keynote speakers, including Professor Tsianina Lomawaima from the University of Arizona. Professor Lomawaima spoke on a largely neglected area of Native American government school history: the bilingual education programmes and very limited cultural tolerance implemented by the Bureau of Indian Affairs in the 1940s. In a sometimes humorous analysis, she revealed that the bilingual readers commissioned by the BIA all too often preached unsubtle assimilationist messages to Native children and communities, and were predominantly authored by non-Native BIA employees with little Native input aside from illustrator and translator roles. However, Lomawaima then drew attention to the bilingual readers devised for Hopi communities in the mid and late 1940s. Although these readers were BIA-produced, they drew upon genuine Hopi cultural features, such as the arsenal, kilt and body paint used by the protagonist in the story Field Mouse Goes to War, and the Hopi text offers a translation that is firmly rooted in a Hopi cultural context. Describing this process as ‘Hopification’, Lomawaima showed that Native voices could penetrate and subtly subvert the assimilationist message of the BIA. In addition, she drew attention to the viability of ‘footprinting’ — the search for unintended ‘scraps’ of Native voices and thoughts contained in the government archives. The rehabilitation of the government archive as a viable, albeit limited, source in Native Studies, was an important feature of this paper, as was the overriding message that Native voices continued to be raised during an era of intense government paternalism towards Native American communities. The issue of translation was also raised by keynote speaker Professor Robert Warrior from the University of Oklahoma. Professor Warrior spoke on his personal current experience of learning the Osage language. He noted the difficulty that those who are accustomed to an Indo-European or Latin based language experience when trying to learn Osage, but emphasised the need for proficiency in one’s native language. Brian Maracle strengthened this theme with his discussion of the Mohawk Language Programme. Again, the differences between Anglo/Latin and Native languages were revealed: the words empty and zero do not exist in Mohawk. The difficulties yet absolute necessity of maintaining Native languages as living, viable languages spoken and used in daily life, were strongly emphasised. The conference featured many stimulating and important papers, but unfortunately it is only possible to summarise a few. The renowned Acoma poet Simon Ortiz and the German scholar Gabriele Schwab presented two interwoven and moving autobiographical accounts of childhood trauma and memory. The colonization experiences of the Sami people of Norway were also included in the conference. Kaisa Rautio Helander (Sami University College) discussed the process of toponymic silence, by which the state of Norway manipulated and indeed sought to silence Sami place names and thereby Sami connection to the land. Don Fixico (Arizona State University) brought an esoteric dimension to the conference with his paper on the place of spirits and visions in Native American historical reality. A paper that begins with the request “Stand up everyone who has experienced a ghost” is guaranteed to engage from the outset, and this paper, which looked at ghosts, spirits and their importance, did not disappoint. The concluding word was supplied by Roger Maaka of the University of Saskatchewan. Speaking on Native Studies in the Academy, Professor Maaka reminded us that Native Studies is a people-centred, rather than a university-centred discipline. He noted that the scholar of Native Studies has a role to play in the social advancement of indigenous people, and also in the education of non-indigenous people. In addition, he addressed the need for the emergence of indigenous epistemological theories and urged us to recognise that external theories such as Marxism and Foucaultian analysis can be limited when applied to a Native context. Such invariably Euro-American theories can be of value in Native Studies, but only to a certain point before a divergence is reached. Indeed, Professor Maaka posited the idea that silence itself could be an indigenous theoretical premise. He also emphasised the different contextual strands of Native Studies: the local, the national, and the global. The local represents the essence of indigenous studies, but the scholar must recognise the existence of different local identities and avoid the convenience of generalization. The national sphere is essentially concerned with pan-indigenous approaches, usually originating within the colonial paradigm and thus different to the local sphere. Finally, Professor Maaka discussed the global sphere of Native Studies that involves cross-community contact and also comparative studies of indigenous communities. He described indigeneity as the ongoing struggle to emerge from colonization, and reminded scholars that, as a discipline, Native Studies must remain indigenous centred and indigenous focused. Overall, the conference was an illuminating experience and offered a fresh opportunity for discussion between Native and non-Native scholars of different nationalities. The productive discussion that followed each paper bodes well for future NSRN conferences and forums.